Potatoes are the perennial side dish. With many varieties and a neutral, earthy flavor, this starch is a staple of many meals. Potatoes also make great main dishes, and can be served for almost any meal. This is a hearty lunch soup that cooks up in about 20 minutes. It has great flavor and is perfect for a winter luncheon. Chop bacon and cook in a large soup pot until crisp over medium high heat. Remove bacon from oil and set aside. Add leeks to bacon fat and cook until soft. Add flour to leeks and bacon fat and stir, cooking for 2-3 minutes to remove raw flour taste. Add chicken broth to pot, scraping flour from bottom and stirring to incorporate. Bring to a boil. Add potatoes and reduce heat to medium. Pour about half of the soup into a food processor or blender and process to puree. Be careful to allow steam to escape as you puree. Add back to remaining soup and stir to incorporate. Soups generally contain flavorful broth with vegetables, meat, and assorted spices. Potato soup, on the other hand, is often prepared without any meat, though some people prefer to add bacon or canned meat to the recipe. Potato recipes for soup is usually thick, with the inclusion of cornstarch, flour, cream, milk, or grain used as an extra thickening agent. When cooking potato soup, be sure to use bite-size chunks of potato, as well as celery, onion, carrot, or any desired vegetables. Depending on the preferred result, potato soup can be chunky (with firmer chunks left floating), or cooked until the pieces are soft and then pureed for a creamy variety. Leftover soup can also be pureed, or simply reheated for another delicious, hearty meal. There are so many things you can make with potatoes for every meal. Hash browns are easy to make beautifully if you know a few tricks. The onions in this recipe add flavor, while squeezing out the water makes them nice and crispy brown. Mix grated potatoes and onions. Place in a colander or potato ricer and squeeze out all excess water. Alternatively, you can wrap grated potatoes and onions in a dish towel and wring them out over the sink until no more water comes out. Blot potato mixture with a paper towel to remove as much excess moisture as possible. Heat butter over medium high heat in a 12" non-stick sauté pan. When butter bubbles, add potatoes in a single thin layer along the bottom of the pan. Lave potatoes in contact with pan until they brown thoroughly, about 3-4 minutes. Use a large spatula to turn the potatoes. Cook until brown on the other side, about 2-4 minutes. These are perfectly fluffy mashed potatoes. The trick is to bind the starch with fat, which keeps them fluffy and light rather than gluey. 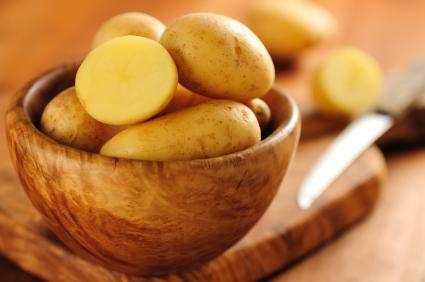 Place potatoes in a large pot with cold water and heat to boiling. Strain water from potatoes in a colander. Working in small batches, place the potatoes in a potato ricer and press through into a bowl. When all of the potatoes have been riced, add butter, salt, and pepper to taste and stir just until butter is incorporated. Potato recipes have a rich, healthy history. The vegetable originated in South America thousands of years ago and today is grown throughout the world. Potatoes are an important dietary staple in many countries, but many people associate this vegetable with Ireland, where it was first adopted in the late 1700s. In the 1840s, a fungus infected potato crops throughout Europe, which caused devastation among populations that had come to depend on the hardy vegetable as a principal source of food. Known as the Irish Potato Famine, the event led to massive starvation and emigration. Ancient civilizations, such as the Incas, used potatoes for medicinal purposes as well as to create nutritious potato recipes. They were thought to prevent indigestion and raw slices were used to help heal broken bones. While those ancient practices may be no more than folklore today, modern home remedies include using grated potato to ease the pain of sunburn and treating acne with potato juice. Despite their unassuming appearance, these roots contain high nutritional value. Virtually fat-free, a medium potato has only 100-120 calories (depending on the variety: red, white, or yellow), and contains no cholesterol or sodium. At the same time, potatoes provide essential B vitamins, iron, complex carbohydrates, and vitamin C.
Whether you have potatoes au gratin as a dinner side dish or baked sweet potatoes for lunch, potatoes are an affordable, healthy, and satisfying food.